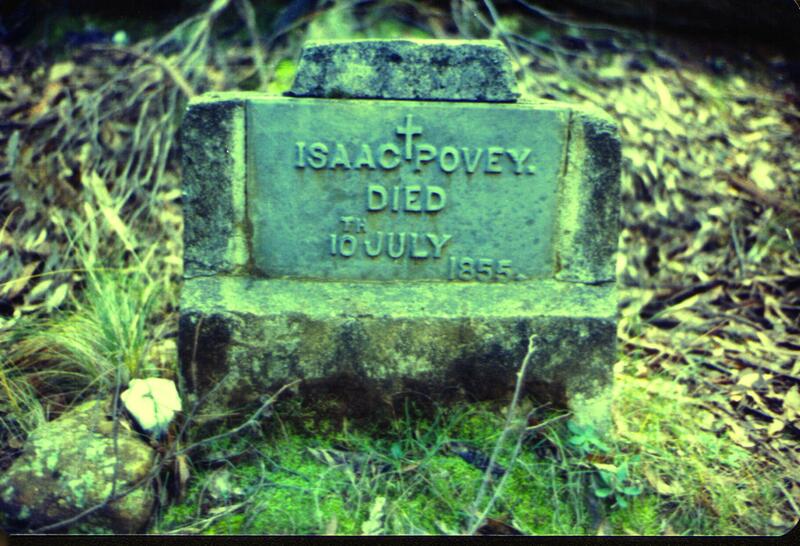 Isaac Povey’s grave, Deadman’s Hill, Simmons Reef. Hidden away over the creek, west of the Garden of St. Erth, is the grave on a hill now named Deadman’s Hill. Forgotten my many and visited by view in a secluded part of the bush is where a miner was buried in 1855, on his gold mining claim. Isaac Povey arrived in Australia with Edward (John) Hill in 1854. Isaac Povey and Edward Hill came from West Bromwich, in Staffordshire, near Birmingham in England. Povey and Hill were said to have first gone to Sydney where they worked on the Sydney Mint at their trade as bricklayers. Later they arrived in Melbourne and made their way to the Mount Blackwood ranges. Within a year Isaac Povey caught a chill and died, age 24 years, on the 10th July 1855. As there was no cemetery at that time in Blackwood, John Hill buried his friend on his claim, in a coffin made of sheets of bark, on the summit of the hill now known as Deadman’s Hill, Simmons Reef, and marked the grave with stones and a wooden tablet. Today a headstone in the bush marks the place where Isaac Povey died. Isaac Povey had left his home town and told his sweetheart Mary that he would return with lots of gold and marry her. John Hill stated twenty three years later that “he could not let poor Mary know of his fate because he did not know where she lived and Isaac was too bad to tell us at the last.” So Mary waited, but Isaac never returned. Many years later, the lone grave was visited by a Mr. Tom Johnston then the proprietor of a foundry in the Melbourne suburb of Brunswick. Some years later, Mr Johnston visited Birmingham on matters connected with his foundry business, and walking along a street, he noticed above a business premises, the name of Isaac Povey, which struck a chord in his memory. On impulse, Mr. Johnston went inside, and on meeting the principals of the firm, asked if any relative of theirs had gone to the Australian goldfields. He learned that there was indeed, a relative called Isaac Povey who had gone to Australia, and the family believed, although without certainty, that he had died soon after arriving in Australia. To their very great interest and gratitude, Mr. Johnston told them of the grave of Isaac Povey on the hill above the Lerderderg River in Simmons Reef in Blackwood. Several years later, around 1926, a bush fire swept through the hills, and the wooden tablet on the grave of Isaac Povey was destroyed. Mr. Johnston having heard of the fire, made another visit to Blackwood and revisited the grave. 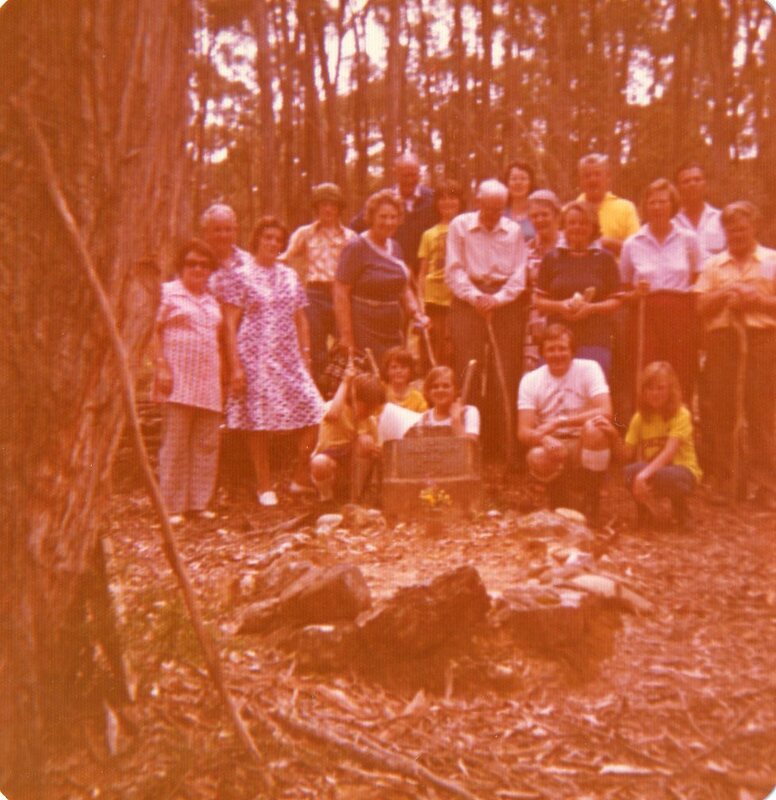 Members of the Blackwood & District Historical Society with George Trewehella age 86 yrs, in front middle with walking stick, on a visit to Povey’s Grave 1975. Back row – Mr Povey, Matthew Pearce, Les Armstrong, Philip Hitchcock, Margot Hitchcock, Laurie Watson, John Grixty. Front Row – Twins Geraldine & Charlene Gallop, Sandra Hitchcock, Adrian Pearce, Louisa Pearce.